Today, I’ve got some young adult (YA) fiction (a.k.a. kid’s books) to talk about. In fact, I’ve got a swath of YA books (at least 15) to talk about, but I’m limiting this to four. First, from Tyndale is the latest episode from the Imagination Station series. Then, two comic book meets novel hybrids – one from the library and one from Tommy Nelson. And finally, Harvest House offers a Bible study for kids with a topical collection of memory verses. Okay, let’s get to the quick. 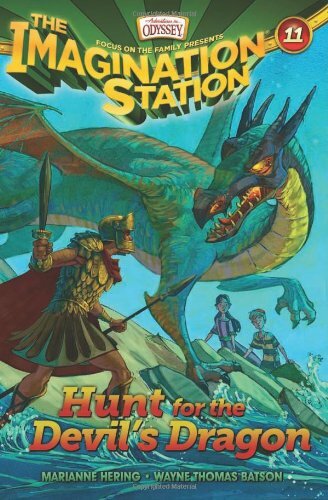 The Imagination Station series, which falls along the lines of Magic Tree House and Secrets of Droon books, takes finds a nice balance between focusing on Bible accounts and stories of the Christian faith. This time the time-traveling cousin duo of Beth and Patrick encounter first hand the tale of Saint George and the Dragon, which has many sources and variations. Here’s how this one plays out (with minimal spoilers). Beth feels regret for chickening out in the face of a bully picking on her friend. Mr. Whit sends her to ancient Africa with Patrick to witness the courage of Saint George, a newly converted Christian who stands up for the rights of peasants under the rule of the Roman forces. And to keep everyone’s interest throughout the story, there are dragons and other fantastical creatures. Through it all, Beth (along with Patrick and the readers) learns the intended lesson. NOTE: I received a complimentary copy from the Tyndale Blog Network in exchange for an honest review. Sign up for Tyndale Rewards or the Tyndale Blog Network and learn how to get free books, too.